- Will you bet on the color. - When you lose, the next time you bet just as much as you just lost. - Once you win, the next bet will be a dollar higher. - This way you do in the meantime until you € 1 in the plus. 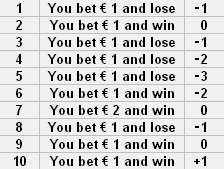 - An important point is when ending a losing series, you're starting to get back into the plus, you bet only what you obtained for the entire sequence € 1. There is no need to take risks! - After that series ends profit and start again.